Auto-Visual AFP Detection and Reporting (AVADAR) is a mobile sms-based software application designed to improve the quality and sensitivity of Acute Flaccid Paralysis (AFP) surveillance by health workers and key informants within hospital facilities and local communities. 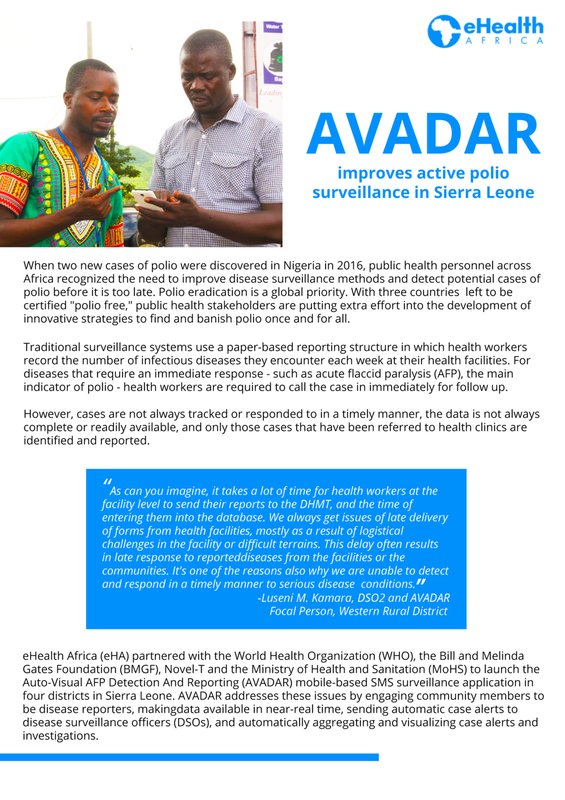 Auto-Visual AFP Detection and Reporting (AVADAR) is a multi-country project currently operational in 7 polio high risk countries in Africa. Acute Flaccid Paralysis (AFP) is the main indicator of polio. 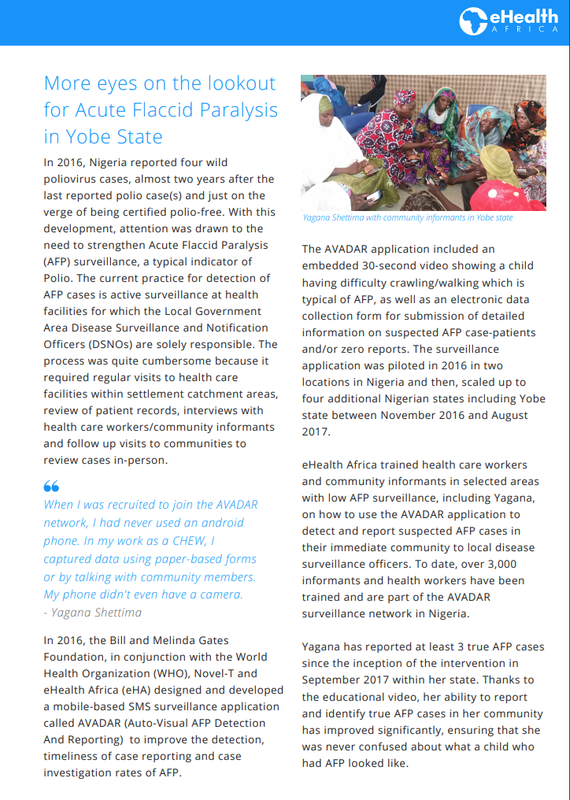 AVADAR enhances traditional AFP surveillance systems by “widening the net” of disease reporters and using an sms-based mobile technology to improve the completeness, timeliness, and availability of AFP reporting. When informants report suspected AFP cases, automatic case alerts are sent to the appropriate disease surveillance officers, and the resulting data is automatically aggregated, visualized, and made available for decision makers. AVADAR is an important component in the global “end game” for polio. The AFP video component was developed by World Health Organization (WHO) and eHA, and the software design component was handled by Novel-T. To date, eHA has translated the app into 17 languages. The selection of informants (including health workers) was led by the WHO and each country’s Ministry of Health team. Once selected, screening and training was jointly conducted by WHO, the Ministries of Health, and eHealth Africa team. In several countries, “special informants” with limited literacy participate in the project via a simplified version of the app that only requires a “yes” or “no” response to having seen a child with AFP symptoms. There are currently 156 special informants in the AVADAR network of 5,198 trained individuals. 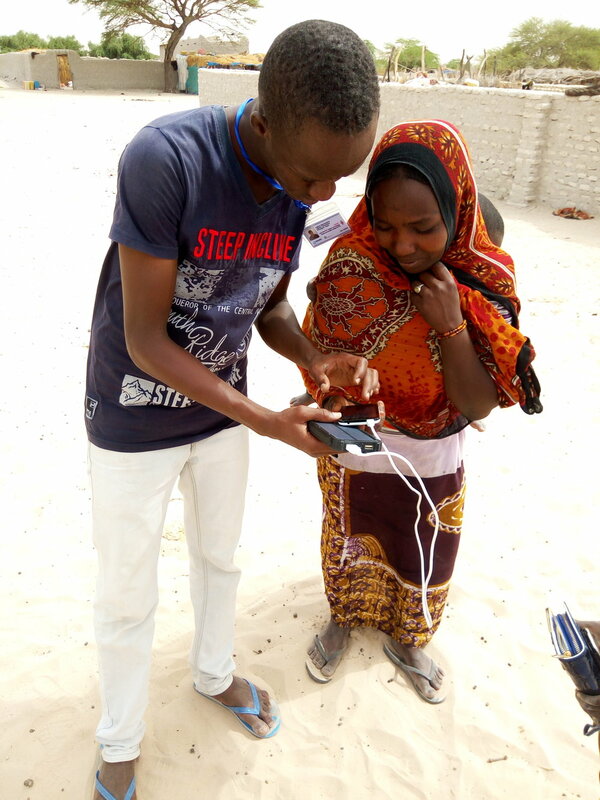 Joint supervisory field visits are conducted on a monthly basis by WHO, Ministries, and eHealth Africa field teams to provide troubleshooting phone support for informants, conduct re-training sessions, and identify noncompliant informants. eHA has resolved 8,467 technical phone issues.